Today’s customers, investors, and employees are more conscious than ever and expect companies to meet their expectations and be transparent with their performance. Understanding what these expectations are is therefore crucial for every business in the 21st century. However, the process of analyzing these material aspects can be both time-consuming and complex. We introduce Worldfavor Sustainability Insight – a tool that makes it easier than ever to benchmark against the most common sustainability areas from other companies in your industry. It gives you insights on relevant areas in GRI Standards and presents the Sustainable Development Goals that they contribute to. Worldfavor Sustainability Insights are based on more than 20,000 data points retrieved from over 200 companies that have adopted the GRI Standards Sustainable Reporting framework. All of the companies in the database have more than 25o employees, and currently, the majority are enterprises from the Nordic countries, but also companies from outside of the Nordics are represented. Data is continuously added on both Nordic and international companies to enrich the analysis, By selecting your company's industry, the tool presents an analysis of the sustainability areas in GRI Standards that companies like yours report on. It also presents which Sustainable Development Goals your business contributes to when addressing these areas. Worldfavor Sustainability Insights can be seen as an easy way to start your sustainability journey, or a smart tool to benchmark your current strategy with industry peers. Worldfavor Sustainability Insights allows you to see what areas within the GRI Standards that are most commonly used by companies in your industry. The GRI Standards, developed by Global Reporting Initiative, are the first global standards for sustainability reporting. They are used by businesses and governments worldwide to understand and communicate their impact on sustainability issues and represents the most widely adopted global framework for sustainability reporting. 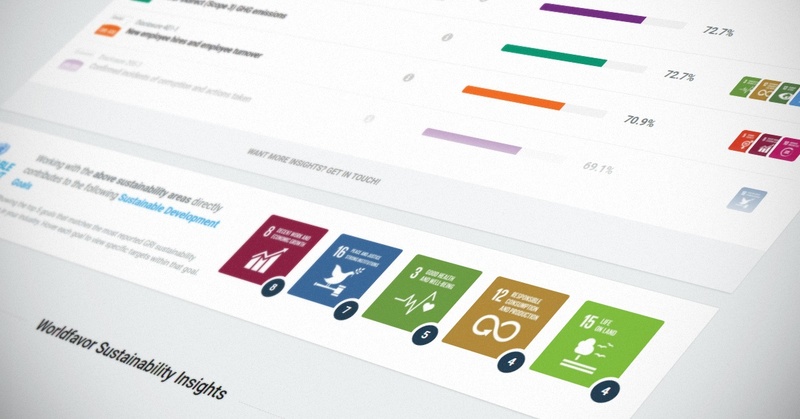 Not only does the tool present relevant areas in GRI Standards, but it also gives you the matching UN Sustainable Development Goals that your business contributes to by addressing the are. The Sustainable Development Goals (SDGs) are a collection of 17 global goals set by the United Nations to ensure that development and human well-being continues to advance within the planetary boundaries. We launched Worldfavor Sustainability Insights to help you kick-start your journey to becoming a 21st Century Company or to benchmark your current strategy, without time-consuming and costly processes. Like a materiality analysis, these insights can be used to identify relevant sustainability areas for your business. Access your free analysis now and invite colleagues to take part of it!